A necessary tool for removing the alignment inserts on the upper control arm alignment brackets without damaging the bracket. Includes a center punch for the older GM vehicles and newer Jeep JKs and an offset punch for GM’s newer models. Aligning these trucks can be difficult because it is impossible to access the head of the cam bolt to adjust alignment angles. This special grooved socket fits over the end of the bolt allowing the technician to turn the alignment cams to change alignment angles after loosening the lock nut. This socket makes aligning these 4WD trucks much quicker and easier. 85796 is a 3-in-1 puller that makes removing the spindle from four wheel drive vehicles much easier. This puller fits spindle sizes 1-1/2”, 1-5/8” and 2” spindles that are O.E. on 4×4 trucks. This sleeve puller will pull both O.E. and most aftermarket camber/caster sleeves quickly and efficiently, usually without damaging the ears of the sleeve. Heat treated high strength steel. Single-unit design with no loose parts. This puller is designed to work specifically with the 23100 and 23120 sleeves. It will allow the technician to pull the sleeves without normally breaking the ears off the sleeve. These wrenches make presetting our adjustable truck sleeves easier for the installer. When using the 74400 wrench it is recommended that the opening be equally positioned over the slot opening of the sleeve body. This wrench is specifically designed to adjust the 86640 Camber/Caster Kit. This steel wrench is plated for durability. This 1-1/2” socket is useful for adjusting both the OEM and our popular 23130 and 23180 sleeve series for Ford and Mazda RWD and 4WD trucks with pinch bolt style suspension. For 1/2” drives. 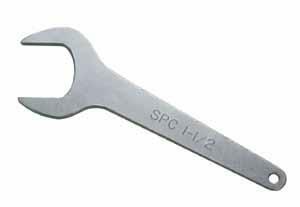 Thin walled spanner wrench designed specifically for installation and removal of O.E. and 23000 screw in 4WD alignment sleeves.